As a genius organizer, you probably have a variety of tech tools helping you run your events. Have you ever wished that all those tools could work together? When you connect SignUpGenius and Zapier, they can! Zapier moves information among your web apps automatically, so you can focus on your most important work. 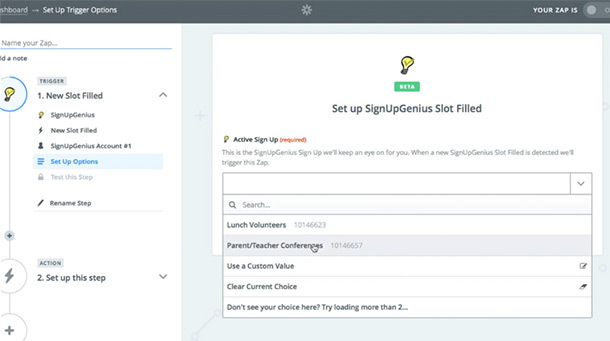 First, make sure you are signed up for a SignUpGenius premium plan and are registered with Zapier. Once you log in to Zapier, you can start creating Zaps. Think of a Zap as an if/then statement: if a trigger happens, then Zapier will search for data and the action will take place. A common Zap that SignUpGenius creators implement is with Google Sheets. Every time someone signs up, that participant’s information is pulled and automatically added to a Google spreadsheet. Here’s how the magic happens. 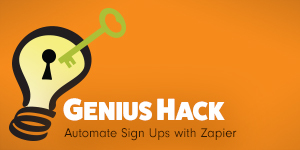 Click to make a new Zap, and choose SignUpGenius as the Trigger App. From there, choose “New Slot Filled” as the trigger. Zapier will then ask you to sign in to your SignUpGenius account, and you’ll need to click “allow” to give Zapier access. Then, choose which sign up you want to automate. 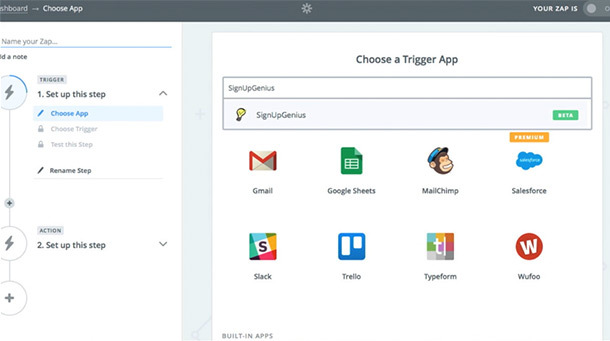 Next, you can test the trigger action — just make sure that you have a test participant signed up already so that Zapier has data to move from SignUpGenius to Google Sheets. The trigger is ready! You can now set up the action. 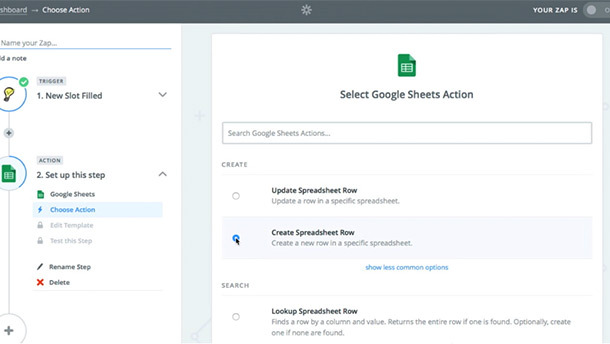 Choose Google Sheets as the Action App, and then choose “Create Spreadsheet Row” as the Action. After giving Zapier access to your Google account, make sure you choose the correct spreadsheet and worksheet. Genius Tip: Create the spreadsheet ahead of time with column headings so it’s ready to receive information from your sign up. From there, you can test the entire Zap to make sure that the information is ready to automatically roll. Start automating your sign ups today — that’s genius!